Angus, the lead guitarist for AC/DC. The band known for its insane power chords and awesome vocalist's Bon Scott and Brian Johnson. He is one of the 3 Young brothers that started the band. He was ranked 96th on Rolling Stone's list the 100 Greatest Guitarists of All Time. His first guitar he "created" when he was 5. He took a banjo and strung it like a guitar. He likes to keep his personal life private. Which I find quite interesting, because someone as awesome as him would normally have tons of people fighting to get information out of him. Malcolm has been described as the business and brains behind AC/DC. 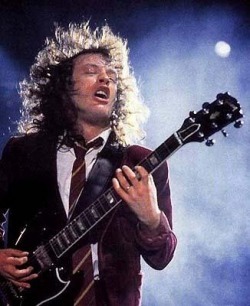 As the rhythm guitarist, he is responsible for the broad sweep of AC/DC's sound, and co-writer of the material who has developed many of the band's well-known riffs. But behind the scenes, his word is said to be 'law' on matters such as organising when and where the band go on tour, whether to make an album or film soundtrack, and when to meet the media. 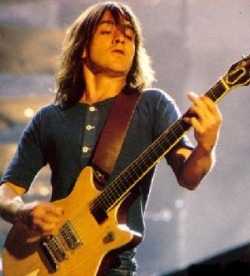 Malcolm Young is regarded as a leading rock exponent of rhythm guitar. His economic playing, 'groove' and riff-based compositions have been highly influential on subsequent hard rockk and heavy metal music acts. In 1974 Scott was working as a driver and general hand in Adelaide. He then met the touring members of AC/DC, including brothers Angus and Malcolm Young. At that time, AC/DC's lead singer was Dave Evans, but soon the Young brothers decided that Evans was not a suitable frontman for the group as they felt he was more of a glam rocker. Scott, who had become the band's driver, expressed an interest in becoming their drummer, but the band kept telling him they didn't need a drummer, they needed a singer. Bon Scott replaced Dave Evans as the lead singer of AC/DC in September 1974. With the Young brothers as lead and rhythm guitarists, drummer Tony Currenti and George Young as a temporary bassist, AC/DC released High Voltage, their first LP in Australia in February 1975. Within a few months Currenti was replaced by Phil Rudd and Mark Evans was hired as a permanent bassist, and AC/DC began recording their second album T.N.T., which was released in Australia in December 1975. The first AC/DC album to gain international distribution was a compilation of tracks from the first two albums, also entitled High Voltage, and released in May 1976. Another studio album, Dirty Deeds Done Dirt Cheap was released in the same year, but only in Australia; the international version of the album was released in November 1976 in the U.K. and in March 1981 in the U.S., with a different tracklist. Audio samples: "Night Prowler" (1979) "Night Prowler" contains all the new elements of Highway to Hell. The song finishes with Bon Scott saying the Robin Williams' famous catch phrase, "Shazbut Nanoo Nanoo", from the TV show Mork and Mindy. In the following years, AC/DC gained further success with their albums Let There Be Rock and Powerage. The 1978 release of Powerage marked the debut of bassist Cliff Williams (who had replaced Mark Evans), and with its harder riffs, followed the blueprint set by Let There Be Rock. The album was the last produced by Harry Vanda and George Young with Bon Scott on vocals and is claimed to be AC/DC's most underrated album. Only one single was released for Powerage — "Rock 'n' Roll Damnation" — and gave AC/DC their highest chart position at the time, reaching #24. An appearance at the Apollo Theatre in Glasgow during the Powerage tour was recorded and released as If You Want Blood You've Got It. Sadly Scott died in 1980, and AC/DC was on a search for a new great singer. At the AC/DC audition , Johnson sang the songs; "Whole Lotta Rosie" and "Nutbush City Limits" (Ike & Tina Turner). A few days later, the band told Johnson he would be the new vocalist of AC/DC. Johnson's first album with AC/DC, Back in Black (1980), is now regarded as a hard rock landmark. 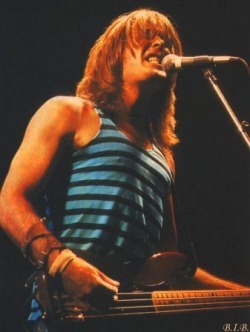 From 1980, Johnson had co-written all of AC/DC's songs, with Angus and Malcolm Young until personal matters diverted him in 1990, when The Razors Edge was being written. Since then, the Young brothers have written all of AC/DC's material. However, Johnson is writing the lyrics for the band's new album, due for release in 2008. Cliff had no hesitation when he was asked to join AC/DC in 1977. At that time, AC/DC was in need of a bassist after the departure of Mark Evans during the Let There Be Rock tour. Cliff joined the band and helped record AC/DC's fifth album, Powerage, the following year. In 1980 vocalist Bon Scott died. 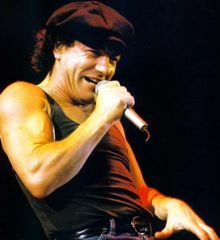 The band regrouped with vocalist Brian Johnson and recorded their most successful album, Back in Black. 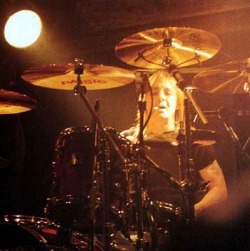 Rudd took Scott's death badly, but continued with AC/DC until he was fired from the band during the recording of the Flick of the Switch album in 1983. When AC/DC went touring in New Zealand in 1994, they called Rudd to see if he would like to "jam" with them. Rudd decided to accept their offer and was eventually rehired. Since his return to the band, Rudd has contributed to AC/DC's Ballbreaker and Stiff Upper Lip albums.